What does McGuinness’s resignation mean for Northern Ireland’s future in the UK? Martin McGuinness said in his resignation statement that the position of the first minister, Arlene Foster, was untenable [Image: Jeff Spicer/PA]. 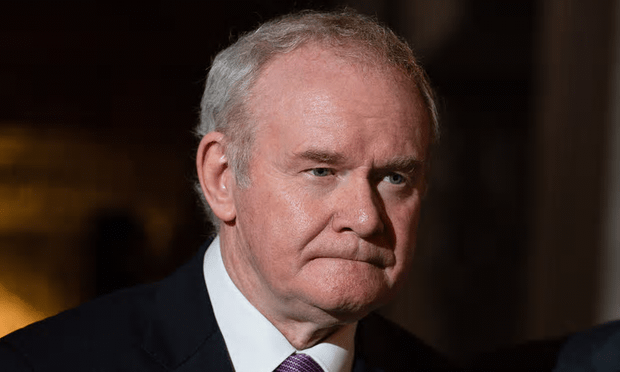 Could Northern Ireland split from the United Kingdom as a result of Martin McGuinness’s resignation? The province voted very heavily in favour of Remaining in the European Union in the referendum last June, and the Northern Irish peace process depends on adherence to the European Convention on Human Rights – from which the UK would depart when it leaves the EU. Put those things together with an opportunity to elect a leadership that supports reintegration with the Republic and suddenly it seems the Union may be in more imminent danger than anybody thought – even with the threat of another Scottish independence referendum over ‘hard’ Brexit. Then again, a huge majority of the population opposes anything that may bring about a resumption of ‘The Troubles’, as they were known, so that possibility must also be taken into consideration. Mr McGuinness’s resignation appears to be mostly about the “Cash for Ash” scandal, a failed green energy scheme likely to cost the Northern Irish taxpayer around £400 million. NI First Minister Arlene Foster has refused to step down, even temporarily, to allow an independent inquiry to take place. So Mr McGuinness resigned, forcing a new NI Assembly election. This means Ms Foster cannot remain as First Minister. If the balance of power shifts to give Sinn Fein the upper hand, it seems likely that a long period of negotiation will be necessary before a new government may be announced. Who knows what the result of those negotiations will be? Seems like a daft regulation, would it apply if he had died, and why have all that problem if someone simply stands down for ill health? The parties are entirely capable of nominating another person to take the place of somebody standing down. Because Ms Foster didn’t stand down, so the DUP didn’t nominate anybody, Mr McGuinness has stood down – and Sinn Fein has deliberately chosen not to nominate a replacement, meaning an election must happen. I didn’t write the rules. It’s one thing to stand by your principles, but in forcing Foster out and presumably getting the investigation he wanted, he has put the possible stability of NI in jeopardy. That’s a bit like cutting off your nose to spite your face. I hope he plays poker well. What a pity that England doesn’t have similar criteria to N Ireland that requires a general election when a PM resigns! It brings the reunification of the island of Ireland one step closer, with the break-up of the UK itself loomsing. At least Northern Ireland get things done, England just drags it’s apathetic arse around like a lame dog, no wonder we’re in such a bloody state!